Property 17: Rest and Relax in The Pocono Mountains! Hot Tub Included! Property 18: Fall/Winter in the Poconos! Hiking, Skiing, S’mores, Indoor Water Parks/ more! Property 19: Spring into a great place to stay! Property 21: Book your summer travel today!!!! Property 22: COZY & CLEAN! 2 BR Pocono MTN Chalet w GREAT location! Property 24: Beautiful New Pocono Chalet! Wait to see this one! Property 27: Lake Harmony Lodge/Gorgeous Lake view/Free Linens/ Sleeps 22! Property 30: Waterfront, Central AC, Walking distance to Island Pool, Lake, & Playground. 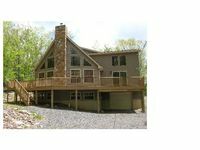 Property 32: Pocono Chalet Lakehouse/Lakefront/Beachfront Vacation Home. Truly one of a kind! Property 36: Deer Crossing Summer Getaway - Lake Harmony Estates - Boating Lake - Pets! Property 44: BEAUTIFUL CHALET! WINTER DEAL! SKI/TUBE/RELAX 7 MIN TO SKI BIG BOULD/JACK FROST! Property 45: Cozy getaway for a Family Friendly Venue! Only 1 mile away from Wolf Run Lake! Property 48: Lake Naomi Club, Memorial Day,Check our Spring and Summer specials, Reserve NOW! Property 50: Come Enjoy the Poconos the way they were meant to be Enjoyed! This house is the best! Me, my brother and a bunch of friends stayed for a fun guys weekend. We had an awesome time. The house is huge, clean and well-maintained with plenty of room for our whole crew. Also plenty of towels and linens for everyone - no need to bring any extra. There are several bars and restaurants within walking distance. The outdoor hot tub was my favorite feature with a beautiful view of the lake. Joseph was very easy to work with and always responded to all my messages, emails and texts in a very timely manner throughout the rental and checkout process. Will definitely plan on staying here again!